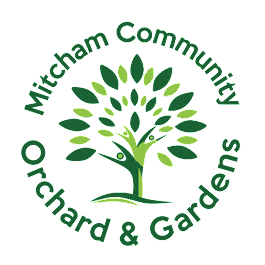 Merton Borough's first ever Wassail at Mitcham Community Orchard and Gardens (CR4 3AL) was a great success with well over 200 people attending of all ages, colours, faiths and creeds, including visitors from Brixton and Carlshalton to name but a couple of places. 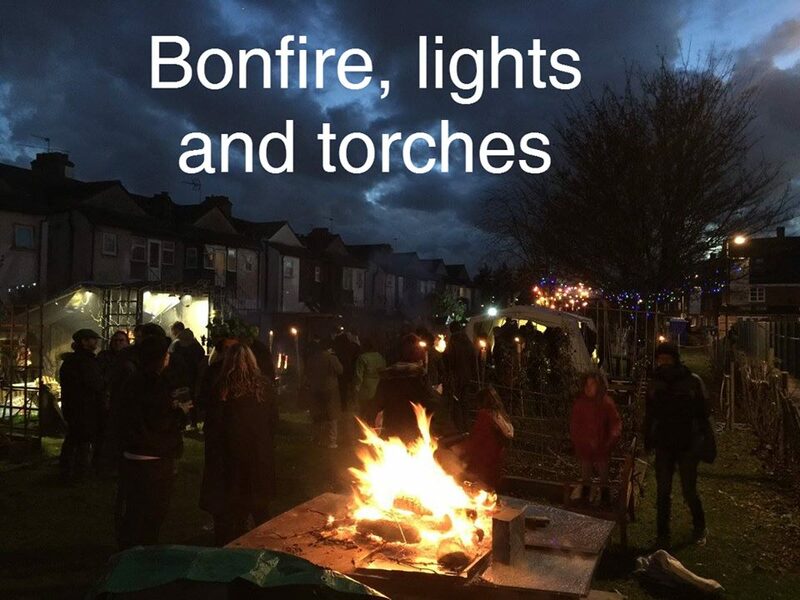 The Orchard was decked with large numbers of coloured lights and was positively ablaze, with a main bonfire, 4 fire pits, 2 Swedish wood torches and 20 burning lamps to name some. These kept all warm, in conjunction with 2 large marquees, one housing the bar. 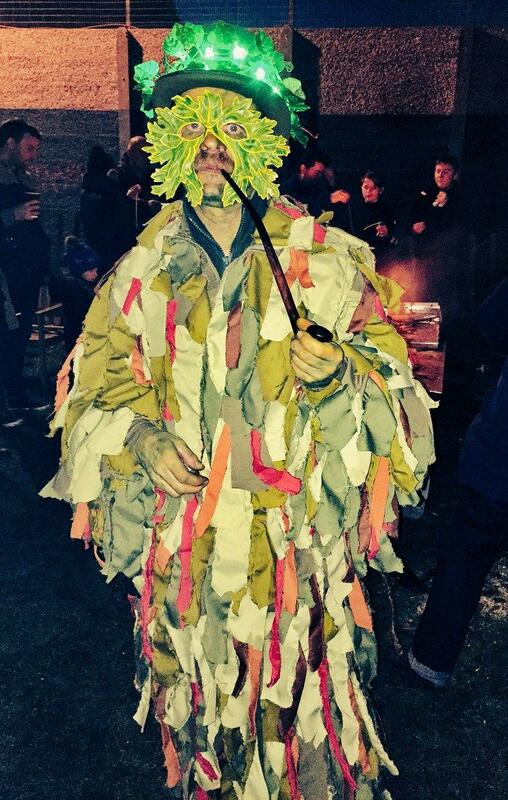 The fires occasionally spat out blue and green flames as the meandering "Green Man" tossed concoctions into the blazes like a Medieval alchemist! 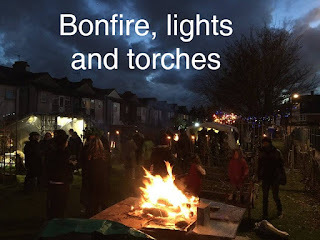 Children particularly enjoyed toasting the available marshmallows on hazel sticks. Some great traditional costumes were in evidence, from Green Man, to Vikings and druids! 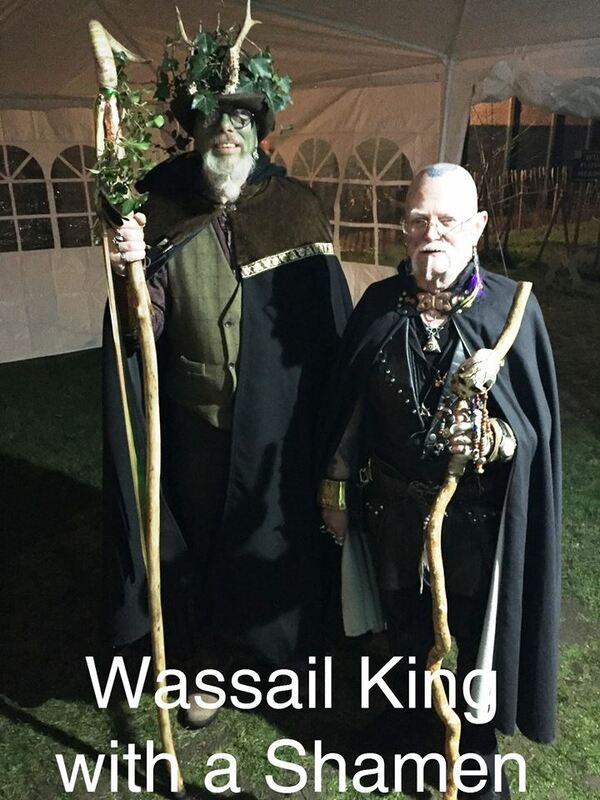 Good to see people getting into the spirit, even if just with leaf-decorated hats. Fantastic entertainment from Black Swan Morris, who performed 2 sessions, the second including the highly popular crowd-participation/ try-out of Morris. 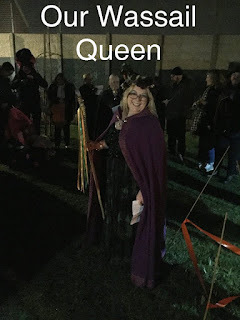 Their "Squire" was particularly impressive, with a huge booming voice. 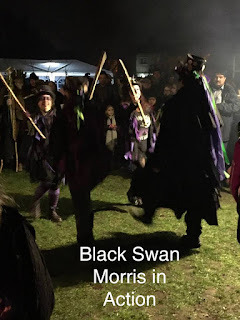 Equally fantastic were The Trafalgar's English Folk session musicians who performed before and after the Morris, joined by various drummers with bodhráns they'd brought! Really made the atmosphere! 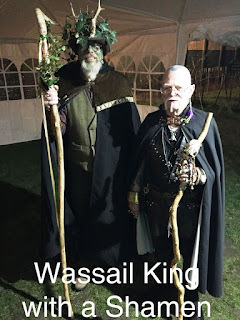 The Wassail ceremony at 7pm was led by the Wassail King and Queen and included recitations, supplications and singing, with the obligatory pouring of cider around the Wassail tree and cider-soaked toast was hung in its candlelit branches. A salute of firework rockets ended the ceremony. The bar quickly ran out of our own Orchard cider, with the Orchard liqueurs proving popular too. There was particularly great demand for the "Lambswool" mulled cider with baked apple pulp and we had to continually brew this warm concoction in a nearby kitchen - sold over 100 1/2 pint mugs (plus over 30 cups of the non-alcoholic version), kept warm on gas burners at the bar! The BBQ did fantastic trade thanks to its staff, also served over 150 burgers and sausages.